What images does the term "digital humanist" bring to mind? Probably a scholar of the humanities who is engaged in coding, programming, or critiquing digital cultures or artifacts. As Digital Humanities Now reported in 2012, a DH'ist is a coder. In the undergraduate classroom, students produce portfolios of code. With a few exceptions, HASTAC blog posts on digital pedagogy assume that digital humanists create; that to teach digital humanism is to foster the production of new digital content. All this is laudable, but it provokes difficult questions. Who is to read all this new material--all the PoetryGenius annotations, class blogs, SCALAR books, and OMEKA exhibits? How can we encourage students to seek out such resources, to read them critically, and to iterate those critical readings to create better original material? Browsing the blogs of students I don't know, at faraway universities, I think of the scene from Quills in which the Abbe Coulmier expresses frustration with the Marquis de Sade's determination to "write more than he reads," which the Abbe finds "the sure mark of an amateur." As a collective, does the DH community code more than we read? There are two ways we can satisfy the Abbe's qualms. Firstly, we can incorporate digital composition into the process of reading and thinking critically about texts. This is what Amanda Starling Gould does in her Szotero project unit. We can also teach students to explore and evaluate existing digital resources. This pedagogical objective not only will expose students to potentially useful resources that they would not find on their own, but tests the usefulness, navigability, and even the aesthetic appeal of evolving resources. To those ends, this term, my 300-level course on The Victorian Era in Literature will include a digital edition review assignment. Students will be divided into groups of four, and each group will be assigned one of the peer-reviewed digital archives at Nineteenth-Century Scholarship Online (NINES). The University of Iowa's Leigh Hunt Online - Keats and Percy Bysshe Shelley's radical editor, who later supported the Italian revolutionary Mazzini and inspired Dickens' Harold Skimpole. Price One Penny - a database of records concerning serialized Victorian "penny bloods," such as Varney the Vampire and The String of Pearls, or the Demon Barber of Fleet Street, with a TEI edition of the generically indicative The Grand Inquisitor. 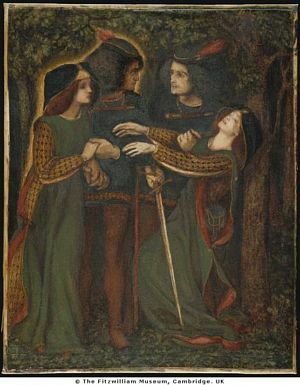 The Rossetti Archive - a hypermedia collection of the writing and art of Dante Gabriel Rossetti, "the most important and original artistic force in the second half of the nineteenth century in Britain." The Old Bailey Online - surviving records of criminal trials in this notorious London courtroom, from the eighteenth century to 1913. Each group will introduce and evaluate their edition in a 5-minute webcast, created using Camtasia. Every few class sessions will begiin with one such webcast. By the end of the term, we will have our own serial guide to NINES to share with the world. And the students will have been reading more than they compose, and, theoretically, guiding the reading of their peers and successors. In his cell in the labyrinthine Asylum at Charenton, the Abbe will be pleased. And wanting an internet connection.